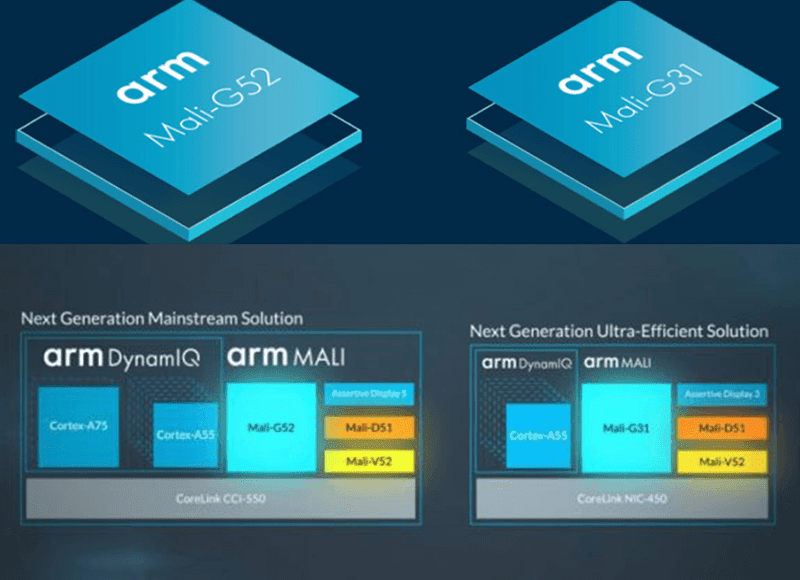 ARM just announced the new Mali-G52 and Mali-G31 GPU, Mali-D1 DPU, and Mali-V52 VPU in an event today. 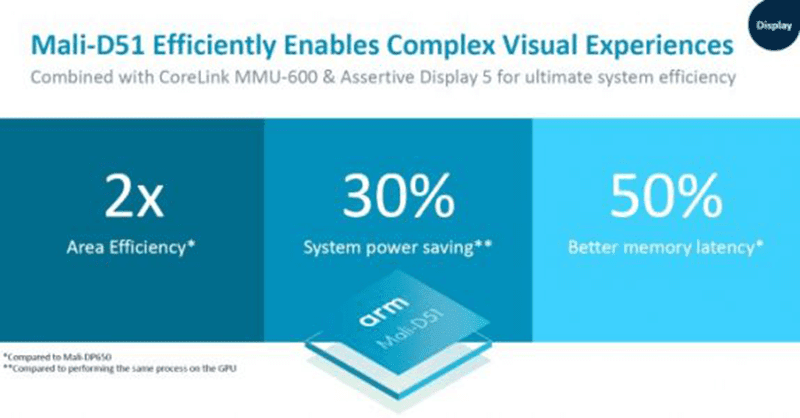 The Mali-G52 GPU is the successor of the G51 with 30 percent improvement in performance density and 15 percent better energy efficiency. Moreover, it has 3.6 times increase in machine learning workloads. It also has up to 8 pipelines wider execution engines for better graphics performance. ARM claims that it still has the dual-pixel shader core implemented to double texel and pixel rates. It'll get 50 percent and 100 percent more FLOPS per core. It also has OpenGLES 3.2 and OpenCL 2.0. On the other hand, the Mali-G31 GPU is labeled as the Mali-400 replacement for the super low-end designs. It is built using Bifrost architecture and it is ARM's current smallest processor with OpenGL ES 3.2 and Vulkan API. It is also 20 percent smaller, but 20 percent better than its Bifrost predecessor. For displays, ARM introduced the Mali-D51 DPU. It is built under the Komeda architecture with 30 percent power saving, 8 full layers of scene complexity, 50 percent better memory latency, HDR support, Assertive Display 5, and memory management efficiencies in collaboration with CoreLink MMU-600. The Mali-V52 VPU is the successor of the Mali-V61 VPU. Its a mid-range VPU with 4K60 encoding and decoding. It has 2x decode performance increase on a 38 pecetn smaller silicon area. 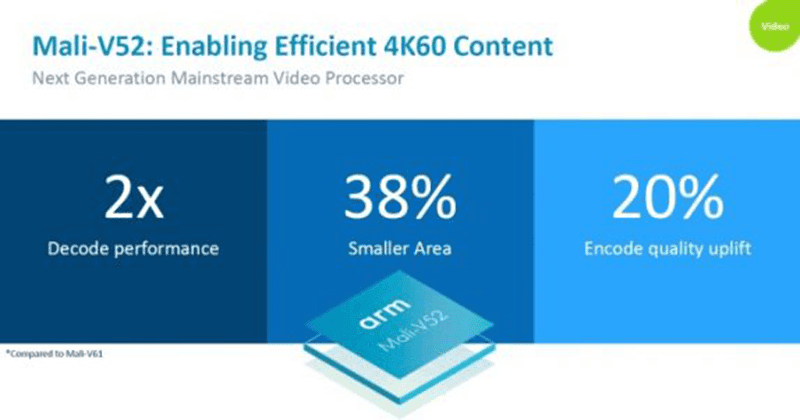 ARM also boasts that the new architecture has improve HEVC encoding with up to 20 percent better quality.